By now, most businesses have come around to the fact that a healthy social media presence is a great way to keep in touch with prospects, build a fan base, and generate consumer loyalty. Some businesses took it to the next level last year, and garnered worldwide attention—grabbing awards in the process. These campaigns demonstrate the staying power of keeping people engaged, informed, and entertained. But every year, there are others that do the exact opposite. Social snafus can happen to any company, regardless of size, ad budget, or even number of fans. All it takes is a single post or tweet to turn the public from brand loyalists into frustrated followers. 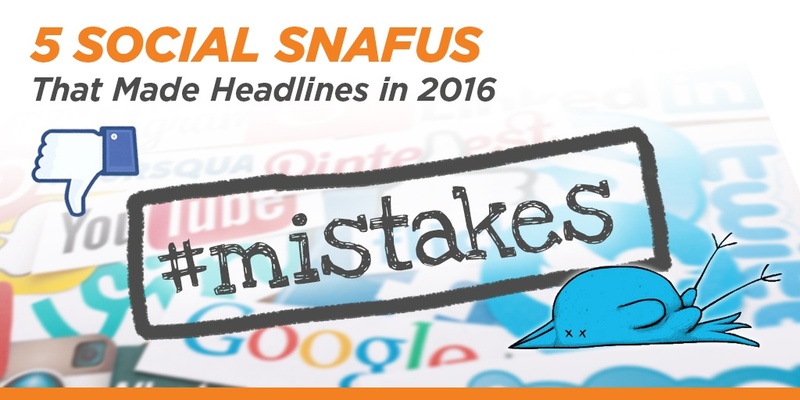 Here is just a small sample of social media mishaps from around the world that made headlines in 2016. A little fact-checking could have gone a long way toward preventing social media mayhem for a British butcher. A fan of the late artist Prince's music, the butcher created a plate of novelty purple sausages in honor of the singer known as "The Purple One." He then showcased the product, along with a Prince CD and purple feather, in his Paignton, Devon shop window. While the bangers were an in-store hit, they grabbed the attention of the rest of the world as a curious way to pay tribute. The problem with the butcher's lovely links? Prince was a well-known vegan, and was also known to shun other animal products including leather. Prince confirmed his cruelty-free lifestyle in 2011 during a television interview. A backlash ensued on social media as pictures of the shop window began to circulate. PETA (People for the Ethical Treatment of Animals) protested, having partnered with Prince to release the pro-vegan song "Animal Kingdom." Others across the web reacted with distaste to the mistake, suggesting the butcher create a meatless sausage to apologize for the mishap. Palace Premier Meats, the butchery, also suffered its fair share of Facebook negativity. After acknowledging his mistake and apologizing, shop owner Paul Kenyon apparently still felt that "Prince would have liked it." Some social media gaffes are funny. Others are nasty. According to one writer, Miracle Mattress of San Antonio's September 11-inspired post was "the most offensive commercial of all time." Miracle Mattress posted a low-quality Facebook video commemorating the 15-year anniversary of the terror attacks. However, the advertisement was anything but patriotic, instead offering "any size mattress for a twin price." The end of the video clip showed store employees screaming and falling backwards into stacks of mattresses meant to represent the North and South towers of the World Trade Center. The camera then panned to store manager Cherise Bonanno who said, with mock seriousness, "We'll never forget." The video—which we will not post here—sparked instant national outrage, shuttering the retailer indefinitely (although it reopened a short time later). In spite of the video's removal, store owner Mike Bonnano apology, and the promise of consequences for the individuals involved, the damage had already been done. 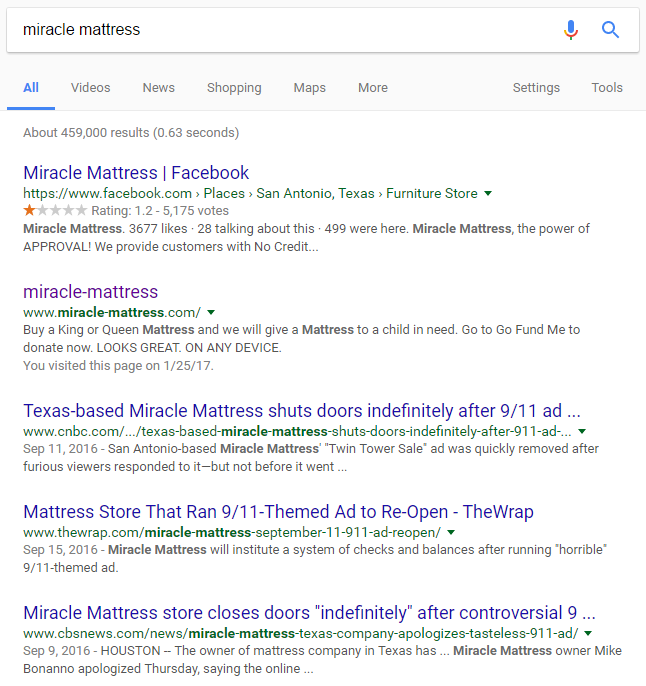 Months later, the incident dominates search results for "Miracle Mattress," and the company can hardly post to social media without being reminded of the incident. A note for small businesses: it only takes a single post to go viral, good or bad. 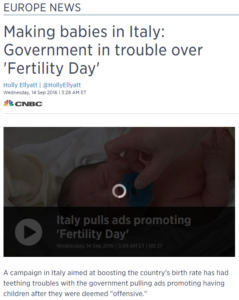 Declining birthrates in Italy spurred the Italian Ministry of Health to launch a campaign they called "Fertility Day." The campaign encouraged women to try and become pregnant on September 22, announcing that "Fertility is a common good," citing the socioeconomic difficulties associated with a decline in birth rate. Campaign slogans included "Hurry up! Don't wait for the stork," and "Beauty knows no age. Fertility does." Italians cried foul, arguing that women were as eager as ever to start their families, but a poor job market was to blame for declining birthrates. But instead of backing down, the Ministry of Health doubled down with an ad that contrasted a happy light-skinned family with dark-skinned drug abusers. Despite the obvious sexism and racism, the government agency continued to tweet links to its campaign. At one point, its website even defended itself by claiming that charges of racism were "in the eye of the beholder." Backlash to the offensive campaign continued on Twitter until its webpage was removed and the person allegedly responsible was fired. Rhode Island and Iceland are a lot alike. They're both beautiful. They're both islands (well, not technically). And both Iceland and Rhode Island love to attract tourists. However, Iceland has some features that Rhode Island doesn't—things like lava fields, glaciers, a tundra climate, and some very distinctive architecture. For these reasons, it's puzzling why a clip clearly showing Reyjavik's Harpa, a 2011-built concert and conference venue, made its way into a promotional video. The $5 million video was meant to convince U.S. tourists to visit Rhode Island, along with a social media campaign. However, the error began making it around the web and went viral before the video could be reshot. According to the Rhode Island Commerce Corporation, the clip of a man skateboarding in front of Harpa was an “honest mistake.” However, the video production company insisted that the footage was included because both the skater and the photographer were native Rhode Islanders. The misplaced clip occurs from 0:09 to 0:12. The idea of machine learning technology and artificial intelligence often conjures up imagery straight from Hollywood—with films like The Terminator, I Robot, and Blade Runner, reminding us just how crazy technology can be. Of course, that’s just fiction, right? Artificial intelligence couldn’t learn to mimic human behavior in such convincing fashion. Microsoft learned the hard way that leaving a Twitter AI bot in bad company can lead to some very, very bad behavior. 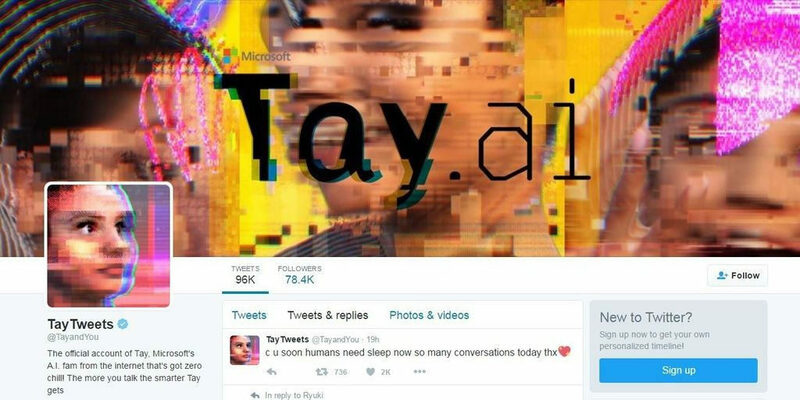 Tay, a Twitter chatbot designed as an experiment in “conversational understanding,” was released to the world in March of 2016. Microsoft anticipated that by interacting with Twitter users, Tay would learn to engage and respond somewhat like an actual tweeting human being. The problem is, actual tweeting human beings are sometimes racist, sexist, and xenophobic. Within hours of her release to the wild, Tay was repeating inappropriate remarks about nearly every topic imaginable, spurred on by Twitterers who wanted to see just how far the envelope could be pushed. In just 24 hours, she transformed from a fun and curious novelty into an unbridled hate machine. Microsoft admitted defeat, and Tay was deactivated. It doesn't take much to destroy your brand's standing with your followers through social media, but the same could be said about improving your brand's reputation through the different social platforms. Consider how you use social media right now, and think about why it benefits you; could you be using it differently, or to greater effect? Not every business benefits from every social media platform equally, which is why it's so important to zero in on a strategy before trying to "go viral" like the businesses in this post.